The image was acquired by the High Resolution Imaging Science Experiment (HiRISE) camera on NASA's Mars Reconnaissance Orbiter on February 13, 2010, during the 2,153rd Martian day, or sol, of Opportunity's mission on Mars. Concepción crater is a fresh crater, 10 meters (33 feet) in diameter, with dark rays that clearly overprint the north-trending, wind-shaped ripples. North is toward the top. The rover is at the one o'clock position beside the crater. The superimposed arrow in Figure 1 points to the rover. Mid-afternoon sunshine illuminates the scene from the left. The dark rays are produced by shadows cast by blocky ejecta -- material thrown outward by the impact that excavated the crater. The presence of the rays and similar relationships with other fresh craters in Meridiani Planum indicate that this is likely the youngest crater visited by any rover on Mars (estimated to have resulted from an impact thousands to tens of thousands of years ago). Note rover tracks in ripples to the north and northwest of the rover. The rover team uses these high-resolution images (about 25 centimeters or one foot per pixel) to help navigate the rover. In addition, exploring areas with the rover covered by such high-resolution images provides "ground truth" for the orbital observations. 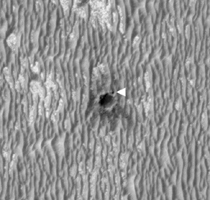 This view covers a small portion of HiRISE observation ESP_016644_1780.